Premise was first released for use in the public arena in the USA in 1996 – it is the original non-repellant termiticide (discussed below). Premise has since built a solid reputation as a reliable long term termite control product with virtually no serious problems encountered in the market place. Premise termite control termiticide from Bayer Environmental Science provides immediate protection from termites like no other product. Firstly, termites are eliminated as they ingest or contact Premise in a treated soil area around the perimeter of a building or other timber structure. In addition, termites can transfer Premise to other termites through social interaction and cannibalism, affecting the entire termite colony. Bayer calls the Premise transfer attribute it’s Domino Effect, which means Premise not only kills termites, but also substantially reduces or eliminates termite colonies. Together these attributes have proven to be highly effective termite eliminator. Premise has delivered reliable elimination of termite problems in more than 1 million homes in the USA. Bayer are so confident of the effectiveness of its Premise product, that they provide a written guarantee to termite controllers in the USA who fully treat the soil areas at the base of a structure as per the Premise label requirements. Part of the Bayer terms and conditions of such a guarantee states in effect “if Premise fails to stop termites at any time within seven years of initial treatment, Bayer will reimburse up to 100% of product and labour costs involved in retreatment to a maximum of $1000 for residential accounts and $5000 for commercial accounts. 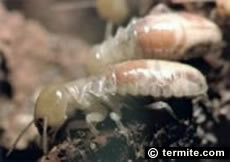 Bayer will also guarantee to pay the termite controller's damage claim insurance deductible up to $500 per structure”. It is a condition of this guarantee that annual inspections are carried out by the same company installing the Premise termiticide soil treatment. Full details are available from the authorised Premise termiticide users in your locality. SAME FAMILY BUSINESS SINCE 1964 FUMAPEST is a second generation family business. After 48 years of providing pest control services in the Greater Sydney, Central Coast and Illawarra regions, we have a valuable reputation in the marketplace and have acquired a wealth of knowledge and experience, unmatched by our competitors. Accredited APCA Member FUMAPEST is an Accredited Member and major supporter of Australian Pest Controllers Association Inc APCA since it's incorporation in 1987.